Taking a new approach to a genre popularized by The Blair Witch Project and Paranormal Activity – what begins as a terrifically creepy cyber thriller (that puts us directly in front of our heroine’s computer screen) soon evolves into a horrific whodunit before revealing its true identity as a found footage feature. 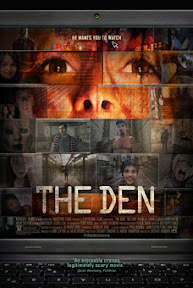 An ingeniously crafted, cleverly conceived directorial debut from Zachary Donohue that was co-written by the helmer and Lauren Thompson, The Den makes the most out of its deceptively simple premise. 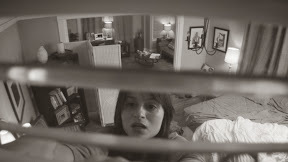 The film centers on a bright and bubbly grad student named Elizabeth (played by Melanie Papalia) whose grant-funded social media research study exploring the individuals waiting on the other side of a random video chat site turns from scholarly to sinister after Elizabeth witnesses what appears to be a real live murder on her screen. Plunging you directly into the action and essentially placing you in the computer chair next to her, The Den alternates between giving you Elizabeth’s point-of-view as well as the disturbingly omnipotent point-of-view of the unidentified person or persons at the other end that begin terrorizing her on and offline. A technique right out of the Hitchcockian playbook where Psycho audiences were forced into witnessing the shower stabbing of Janet Leigh from the vantage point of both the victim and the killer in quick succession, Donohue pulls it off exceptionally well since unlike Norman Bates’s mother, we don’t have a very clear idea as to the identity of our murderer(s) in The Den. Recording everything that flashes across the screen for the good of her study, Elizabeth’s online experiences escalate shortly thereafter when she begins digging deeper for answers both in person and online only to find that the horrors that started on the site called The Den have somehow transferred into her real life, where she’s also being watched offline. Caught up in the middle of something that no amount of antivirus software can identify, in addition to strange recordings, phony e-mails and pixilated videos flashing before her eyes, members of Elizabeth’s immediate circle of family, faculty and friends that often complain that she spends too much time online begin disappearing from her life. While admittedly the last act spirals a bit too out of control too quickly, the otherwise expertly paced build-up of tension in The Den's first half as well as its utterly chilling payoff make for one unforgettable work of cyber horror. An all-around impressive achievement, The Den is a riveting work of do-it-yourself horror that feels frighteningly plausible given our increasing reliance on a Wi-Fi ready society where a new cyber security breach is discovered nearly every week. Technologically solid, Donohue and Thompson make deft use of the many types of online resources upon which we so often rely. From exploring the duplicitous nature of typed chat and fake avatar photos which offer little reassurance that you know exactly to whom you are speaking to the inherent dangers of Google Maps, The Den is sure to make you look over your shoulder the next time you log into your computer... even in your own home. Anchored by its lead, Papalia makes the most out of her underwritten yet challenging part where far too often she’s alone in the frame or conversing with some dubiously unprofessional authority figures who seem a little too eager to ignore her concerns. In fact, despite a few lingering questions, it’s the energetic Papalia who keeps us invested even when the film gets a bit further out of reach during its clichéd warehouse showdown that doesn’t quite gel with the understated, spine-tingling creepiness of the stellar first half. An auspicious feature debut, The Den is elevated by a brilliantly unsettling capper on the undeniably memorable plotline. Likewise, Donohue’s sheer efficiency in telling the inventive story in a brisk 81 minutes helps not only reinvigorate the overcrowded found footage genre but also inspires avid horror fans as to what can be achieved with a killer idea, intellect, a digital camera and hopefully a stalker free computer screen.